Activation of prorenin by (pro)renin receptor stimulates the tissue renin-angiotensin system and plays a significant role in the development of nephropathy in diabetic animals. This study examined whether (pro)renin receptor blockade inhibits the progression of nephropathy that has already developed in diabetic rats. Seventeen-week-old heminephrectomized streptozotocin-induced diabetic rats with an increased urinary protein excretion and a significant glomerulosclerosis had been treated for 12 wk with the (pro)renin receptor blocker (PRRB), angiotensin-converting enzyme inhibitor (ACEi), or vehicle peptide by using subcutaneously implanted osmotic minipumps. At the end of observation, in diabetic rats that were treated with vehicle, urinary protein excretion was progressively increased and a significant progression of glomerulosclerosis was observed. 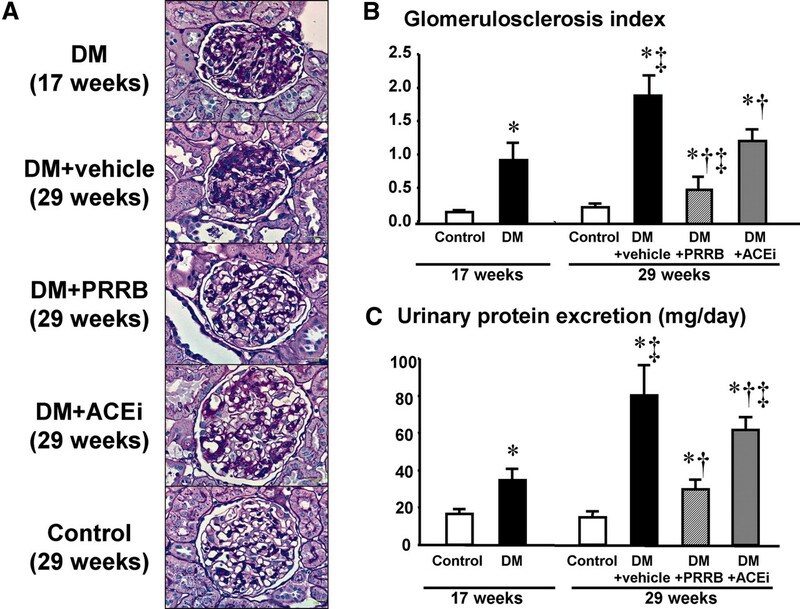 In diabetic rats that were treated with PRRB, however, no further increase in urinary protein excretion or glomerulosclerosis was observed, but 12-wk treatment with ACEi only attenuated further increases in urinary protein excretion and glomerulosclerosis. The enhanced expression of activated prorenin was observed in the kidneys of diabetic rats that were treated with vehicle, whereas it was markedly suppressed in the kidneys of diabetic rats that were treated with PRRB but not ACEi. These results suggest that (pro)renin receptor blockade does not only inhibit the progression of nephropathy but also reverses the glomerulosclerosis that has already developed in diabetic rats. We recently found that nonproteolytic activation of prorenin plays a pivotal role in the activation of the renal renin-angiotensin system (RAS) and the development of nephropathy in diabetic rats and that the (pro)renin receptor blocker (PRRB; formerly handle region decoy peptide) clearly prevented the development of nephropathy and suppressed an increase of renal angiotensins.3 However, whether nonproteolytically activated prorenin is also involved in the progression of nephropathy that had already developed in diabetic rats remained undetermined. This study was designed to determine whether PRRB is able to inhibit the progression of nephropathy after its development in diabetic rats. Prorenin prosegment has a tetrameric segment termed “gate region” (GR; S7FGR10) that is not accessible by its specific antibodies until it is loosened from the active site cleft.1 When prorenin gains renin activity by binding of (pro)renin receptor to its “handle region,” the prorenin molecule undergoes a conformational change to an exposure of GR, and tissues that are bound by the activated prorenin can be visualized by immunohistochemical staining of GR by its specific antibody.4 In this study, therefore, the activated prorenin that was bound to the kidneys from diabetic rats was evaluated using the specific antibody to GR. As shown in Table 1, the body weight of the 17- and 29-wk-old diabetic rats at 12 and 24 wk after the streptozotocin administration was significantly less than that of the control rats. The blood glucose levels of the 17- and 29-wk-old diabetic rats were significantly higher than those of the control rats. Higher blood glucose levels of the diabetic rats versus the control rats were maintained during the 24-wk observation period. The mean arterial pressure (MAP) had been similar in the control and diabetic rats during the 24-wk observation period. Continuous infusion of PRRB by subcutaneous minipumps did not affect the blood glucose levels or MAP of diabetic rats, although the body weight of diabetic rats that were treated with PRRB was slightly but significantly greater than that of 29-wk-old diabetic rats that were treated with vehicle. ACEi treatment did not affect the blood glucose levels of diabetic rats but significantly decreased MAP of diabetic rats. The body weight of diabetic rats that were treated with ACEi was also greater than that of vehicle-treated diabetic rats and similar to that of PRRB-treated diabetic rats. At 12 and 24 wk after the streptozotocin administration, plasma renin activity in the 17- and 29-wk-old diabetic rats averaged 1.24 ± 0.21 and 0.43 ± 0.08 ng/ml per h, respectively, and were significantly lower than those in the control group (3.38 ± 0.35 and 1.7 ± 0.45 ng/ml per h, respectively). PRRB did not affect the plasma renin activity at 29 wk of age in the diabetic rats (0.46 ± 0.08 ng/ml per h), whereas ACEi significantly increased it to 11.6 ± 2.3 ng/ml per h. At 17 and 29 wk of age, plasma angiotensin II (AngII) levels tended to be lower in the diabetic rats (21.4 ± 1.9 and 19.2 ± 3.6 fmol/L, respectively) than in the control rats (29.1 ± 1.9 and 22.7 ± 2.5 fmol/L, respectively). PRRB did not influence plasma AngII levels at 29 wk of age in the diabetic rats (23.6 ± 2.0 fmol/L), but ACEi significantly decreased them to 10.8 ± 1.6 fmol/L. Figure 1, A and B, shows changes in renal morphology in the 17-wk-old diabetic rats; 29-wk-old diabetic rats that were treated with vehicle, PRRB, or ACEi; and 29-wk-old nondiabetic control rats. A significant glomerulosclerosis developed in 17-wk-old diabetic rats and was exacerbated in 29-wk-old diabetic rats that were treated with vehicle. However, the progression of glomerulosclerosis that developed in the diabetic rats was significantly attenuated by ACEi treatment and was completely inhibited by long-term administration of PRRB. Glomerulosclerosis index was similar in the 29-wk-old diabetic rats that were treated with ACEi and 17-wk-old diabetic rats. In 29-wk-old diabetic rats that were treated with PRRB, however, glomerulosclerosis index was significantly lower than that in either 17-wk-old diabetic rats or 29-wk-old diabetic rats that were treated with vehicle. Progression of nephropathy in control rats (□; n = 12); 17-wk-old diabetic rats (▪; n = 6); and 29-wk-old diabetic rats that were treated with vehicle peptide (▪; n = 6), (pro)renin receptor blocker (PRRB; ▩; n = 8), or the angiotensin-converting enzyme inhibitor (ACEi) imidapril (□; n = 6). (A) Periodic acid-Schiff–stained kidney sections. Bars = 25 μm. (B) Glomerulosclerosis index. (C) Urinary protein excretion. *P < 0.05 versus control rats; †P < 0.05 for diabetic rats that were treated with PRRB or ACEi versus 29-wk-old diabetic rats that were treated with vehicle; ‡P < 0.05 for 29-wk-old diabetic rats versus 17-wk-old diabetic rats. As shown in Figure 1C, urinary protein excretion of 17-wk-old diabetic rats, averaging 34 ± 7 mg/d, was significantly greater than that of 17-wk-old nondiabetic control rats (16 ± 3 mg/d). Urinary protein excretion of diabetic rats was further increased at 29 wk of age (79 ± 18 mg/d), but further increase in urinary protein excretion was attenuated in the 29-wk-old diabetic rats that were treated with ACEi (66 ± 7 mg/d) and significantly inhibited in the 29-wk-old diabetic rats that were treated with PRRB (28 ± 11 mg/d). Urinary protein excretion was similar in the 29-wk-old diabetic rats that were treated with PRRB and the 17-wk-old diabetic rats. Figure 2, A through C, shows the immunostainings to nonproteolytically activated prorenin and total renin in the glomerulus from the kidneys of 17-wk-old diabetic rats; 29-wk-old diabetic rats that were treated with vehicle, PRRB, or ACEi; and 29-wk-old nondiabetic control rats. A strong glomerular staining to the activated prorenin was observed in 17-wk-old diabetic rats and was further enhanced in 29-wk-old diabetic rats. 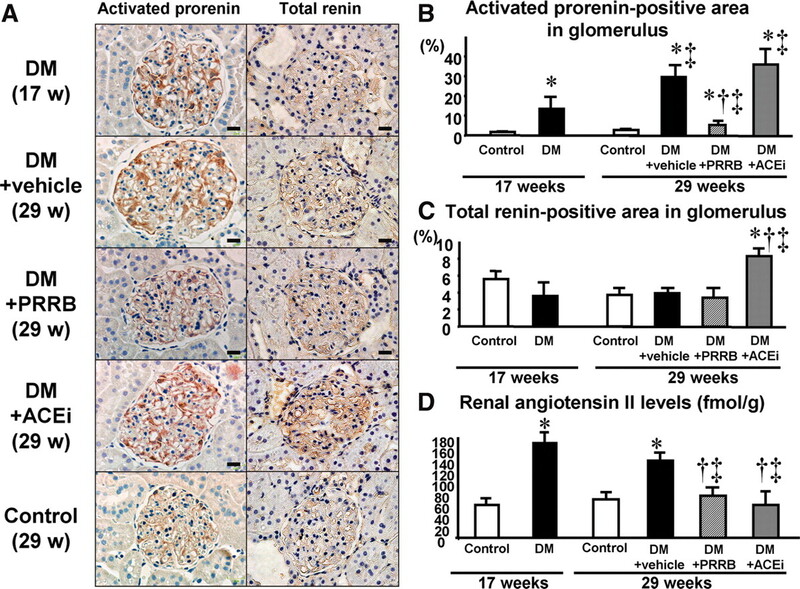 The 12-wk administration of ACEi did not influence the enhanced glomerular staining to the activated prorenin in the diabetic rats, but PRRB significantly lowered it. 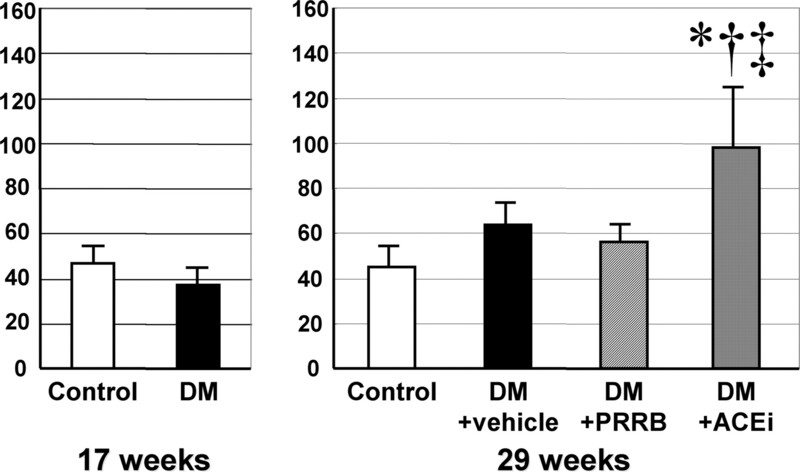 In 29-wk-old diabetic rats that were treated with PRRB, activated prorenin-positive staining in glomerulus was significantly weaker than that in either 17-wk-old diabetic rats or 29-wk-old diabetic rats that were treated with vehicle. However, glomerular staining to total renin was similar among all groups of rats except 29-wk-old diabetic rats that were treated with ACEi. A stronger glomerular staining to total renin was observed in 29-wk-old diabetic rats that were treated with ACEi than in any other group of rats. Renal renin-angiotensin system activation in the control rats (□; n = 12); 17-wk-old diabetic rats (▪; n = 6); and 29-wk-old diabetic rats that were treated with vehicle peptide (▪; n = 6), PRRB ( ▩; n = 8), or the ACEi imidapril (□; n = 6). (A) Immunohistochemistry of nonproteolytically activated prorenin and total renin (renin plus prorenin) by the antibodies to “gate region” (activated prorenin) and renin molecule, respectively. Bars = 25 μm. (B) Quantitative analysis of activated prorenin–positive areas in glomerulus. (C) Quantitative analysis of total renin–positive areas in glomerulus. (D) Renal angiotensin II (AngII) levels. *P < 0.05 versus control rats; †P < 0.05 for diabetic rats that were treated with PRRB or ACEi versus diabetic rats that were treated with vehicle; ‡P < 0.05 for 29-wk-old diabetic rats versus 17-wk-old diabetic rats. As shown in Figure 2D, renal AngII levels of 17-wk-old and 29-wk-old diabetic rats, averaging 170 ± 19 and 139 ± 12 fmol/g, respectively, were significantly greater than those of 17-wk-old and 29-wk-old nondiabetic control rats (60 ± 8 and 70 ± 9 fmol/g, respectively). The 12-wk treatment with PRRB and ACEi significantly lowered the increased renal AngII levels of the 29-wk-old diabetic rats to 77 ± 10 and 60 ± 18 fmol/g, respectively. Renal AngII levels of the 29-wk-old diabetic rats that were treated with PRRB or ACEi were also lower than those of the 17-wk-old diabetic rats. As shown in Figure 3, at 17 and 29 wk of age, renal (pro)renin receptor mRNA levels were similar in the control and diabetic rats and averaged 1.07 ± 0.13 and 1.18 ± 0.20 (ratio to glyceraldehyde-3-phosphate dehydrogenase [GAPDH] mRNA), respectively, at 17 wk of age and 0.94 ± 0.18 and 1.05 ± 0.15 (ratio to GAPDH mRNA), respectively, at 29 wk of age. PRRB treatment or ACEi treatment did not affect the renal (pro)renin receptor mRNA levels of the diabetic rats (1.08 ± 0.14 and 1.03 ± 0.10 ratio to GAPDH mRNA, respectively). Renal (pro)renin receptor mRNA levels of the control rats (□; n = 6) and diabetic rats (▪; n = 6) at 17 wk of age and those of the control rats (□; n = 6), diabetic rats that were treated with vehicle peptide (▪; n = 6), diabetic rats that were treated with PRRB ( ▩; n = 8), and diabetic rats that were treated with ACEi (□; n = 6) at 29 wk of age. As shown in Figure 4, renal prorenin synthesis as evaluated by the mRNA level was lower in the diabetic rats (0.45 ± 0.08 ratio to GAPDH mRNA) than in the control rats (0.69 ± 0.06 ratio to GAPDH mRNA) at 17 wk of age but was similar in both groups of rats at 29 wk of age (0.59 ± 0.08 and 0.45 ± 0.10 ratio to GAPDH mRNA, respectively). PRRB administration did not alter renal prorenin mRNA levels in the 29-wk-old diabetic rats (0.55 ± 0.08 ratio to GAPDH mRNA), but ACEi treatment significantly increased them to 1.41 ± 0.11 ratio to GAPDH mRNA. As shown in Figure 5, renal prorenin resolution as assessed by renal mRNA level of cathepsin B, which was one of prorenin-processing enzymes and predominantly present in the macula densa, was significantly lower in the diabetic rats than in the control rats at 17 (1.08 ± 0.17 versus 1.87 ± 0.18 ratio to GAPDH mRNA) and 29 wk of age (0.34 ± 0.08 versus 0.86 ± 0.19 ratio to GAPDH mRNA). PRRB or ACEi administration did not alter renal cathepsin B mRNA level in the 29-wk-old diabetic rats (0.52 ± 0.12 and 0.48 ± 0.11 ratio to GAPDH mRNA, respectively). This was also supported by renal protein level of cathepsin B at 29 wk of age, which was significantly lower in the diabetic rats (31 ± 16%) than in the control rats (100%) and was unaffected by PRRB treatment (30 ± 11%) or ACEi treatment (44 ± 14%). Renal total renin (prorenin plus renin) levels of 17-wk-old control rats averaged 48 ± 8 ng of AngI/g per h and were unaffected by the streptozotocin treatment or PRRB administration at either 17 or 29 wk of age. However, renal total renin (prorenin plus renin) levels of 29-wk-old diabetic rats that were treated with ACEi (99 ± 26 ng of AngI/g per h) were significantly greater than those of control rats and diabetic rats at either 17 or 29 wk of age (Figure 6). Renal levels of prorenin mRNA in the control rats (□; n = 6) and diabetic rats (▪; n = 6) at 17 wk of age and in the control rats (□; n = 6), diabetic rats that were treated with vehicle peptide (▪; n = 6), diabetic rats that were treated with PRRB ( ▩; n = 8), and diabetic rats that were treated with ACEi (□; n = 6) at 29 wk of age. *P < 0.05 versus control rats; †P < 0.05 for diabetic rats that were treated with PRRB or ACEi versus diabetic rats that were treated with vehicle; ‡P < 0.05 for 29-wk-old diabetic rats versus 17-wk-old diabetic rats. 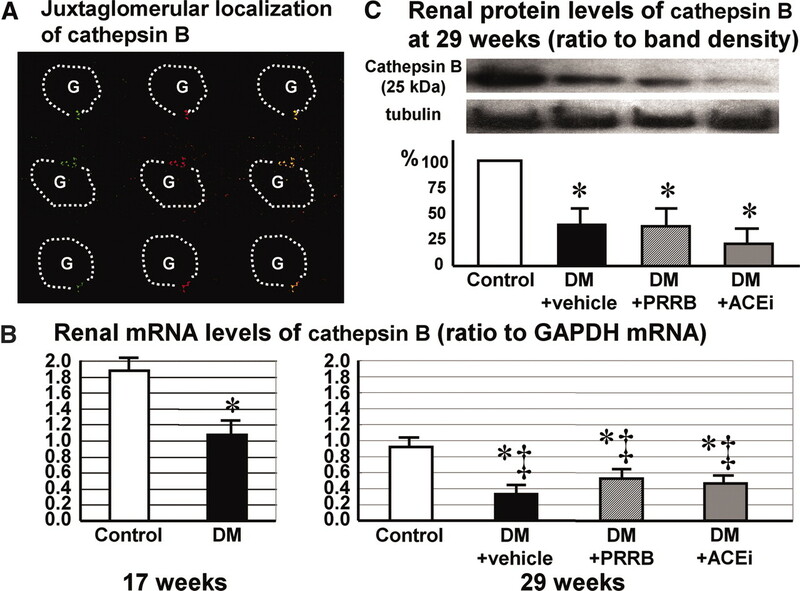 Renal localization and expression of cathepsin B. (A) Double-immunolabeling with specific antibodies against cathepsin B (red) and Tamm-Horsfall glycoprotein (green) in the macula densa adjacent to the glomerulus (G). Bars = 25 μm. (B) Renal levels of cathepsin B mRNA in the control rats (□; n = 6) and diabetic rats (▪; n = 6) at 17 wk of age and in the control rats (□; n = 6), diabetic rats that were treated with vehicle peptide (▪; n = 6), diabetic rats that were treated with PRRB ( ▩; n = 8), and diabetic rats that were treated with ACEi (□; n = 6) at 29 wk of age. (C) Renal levels of cathepsin B protein in the control rats (□; n = 6), diabetic rats that were treated with vehicle peptide (▪; n = 6), diabetic rats that were treated with PRRB (▩; n = 8), and diabetic rats that were treated with ACEi (□; n = 6) at 29 wk of age. *P < 0.05 versus control rats; ‡P < 0.05 for 29-wk-old diabetic rats versus 17-wk-old diabetic rats. Renal levels of total renin in the control rats (□; n = 6) and diabetic rats (▪; n = 6) at 17 wk of age and in the control rats (□; n = 6), diabetic rats that were treated with vehicle peptide (▪; n = 6), diabetic rats that were treated with PRRB ( ▩; n = 8), and diabetic rats that were treated with ACEi (□; n = 6) at 29 wk of age. *P < 0.05 versus control rats; †P < 0.05 for diabetic rats that were treated with PRRB or ACEi versus diabetic rats that were treated with vehicle; ‡P < 0.05 for 29-wk-old diabetic rats versus 17-wk-old diabetic rats. Renal ACE and angiotensinogen mRNA levels were similar in the control and diabetic rats at 17 and 29 wk of age, and PRRB or ACEi did not alter them in the 29-wk-old diabetic rats. At 17 wk of age, renal ACE mRNA levels of the control and diabetic rats averaged 0.47 ± 0.10 and 0.43 ± 0.08 (ratio to GAPDH mRNA), respectively, and at 29 wk of age, those of the control rats, diabetic rats that were treated with vehicle, diabetic rats that were treated with PRRB, and diabetic rats that were treated with ACEi averaged 1.11 ± 0.32, 0.78 ± 0.23, 0.78 ± 0.22, and 0.82 ± 0.25 (ratio to GAPDH mRNA), respectively. Renal angiotensinogen mRNA levels of the control and diabetic rats at 17 wk of age averaged 1.13 ± 0.11 and 1.02 ± 0.23 (ratio to GAPDH mRNA), respectively, and those of the control rats, diabetic rats that were treated with vehicle, diabetic rats that were treated with PRRB, and diabetic rats that were treated with ACEi at 29 wk of age averaged 1.60 ± 0.22, 1.54 ± 0.40, 1.64 ± 0.30, and 1.58 ± 0.37 (ratio to GAPDH mRNA), respectively. In streptozotocin-induced diabetic rats, the development of nephropathy is associated with the activated kidney RAS, and nonproteolytic activation of prorenin significantly contributes to the activation of the kidney RAS and the development of nephropathy.3 However, recent studies showed that the binding to (pro)renin receptor not only causes nonproteolytic activation of prorenin but also stimulates the receptor-mediated, AngII-independent intracellular signals.5 In this study, beneficial effects of PRRB and ACEi on the nephropathy that developed in diabetic rats were compared to differentiate the RAS-dependent and -independent actions of (pro)renin receptor. A significant glomerulosclerosis and increased urinary protein excretion were observed in 17-wk-old diabetic rats at 12 wk after the streptozotocin injection; thereafter, 12-wk treatment with vehicle peptide exacerbated glomerulosclerosis and further increased urinary protein excretion in diabetic rats. Whereas 12-wk treatment with PRRB significantly improved glomerulosclerosis in the 17-wk-old diabetic rats and markedly inhibited a further increase in urinary protein excretion without changing blood glucose levels or MAP, 12-wk treatment with ACEi inhibited a further increase in glomerulosclerosis in the 17-wk-old diabetic rats and only attenuated a further increase in urinary protein excretion. These results suggest that both RAS-dependent and -independent pathways of (pro)renin receptor contribute to the progression of nephropathy that occurred in diabetic rats and that (pro)renin receptor blockade not only prevents the progression of proteinuria but also reverses the glomerulosclerosis that has already developed in streptozotocin-induced diabetic rats. Consistent with previous studies,3,6 the diabetic rats had a lower plasma renin activity and a lower level of plasma AngII than the control rats at either 17 or 29 wk of age. Nevertheless, renal AngII levels of the diabetic rats were higher than those of the control rats. Although renal levels of total renin as evaluated by immunohistochemistry using the anti-renin molecule antibody were similar in the control and diabetic rats at either 17 or 29 wk of age, renal levels of activated prorenin as evaluated by the immunohistochemistry using the anti-GR antibody were also higher in the diabetic rats at either 17 or 29 wk of age. PRRB treatment significantly decreased renal levels of both activated prorenin and AngII, and ACEi treatment significantly decreased renal AngII levels despite increased renal levels of total renin and activated prorenin. Because recent in vitro studies showed that prorenin activation by binding to the (pro)renin receptor can convert angiotensinogen to AngI,7 the activated prorenin is thought to mediate an increase in renal AngII of diabetic rats. To evaluate the expression of activated prorenin in the kidneys, we previously used the antibody to active the center of renin, which binds to both activated prorenin and renin, and found a strong immunostaining in the juxtaglomerular area and a weak immunostaining in the intraglomerular area.3 In this study, however, we used the antibody to the GR of prorenin prosegment, which binds to activated prorenin but not to renin,4 and found a strong immunostaining in the intraglomerular area and a weak immunostaining in the juxtaglomerular area (data not shown). Therefore, the difference in renal staining pattern of activated prorenin might be dependent on the specificity of the antibodies. Whereas renal levels of activated prorenin increased in diabetic rats, (pro)renin receptor mRNA levels did not increase in the kidneys from diabetic rats at 17 or 29 wk of age. In addition, renal prorenin mRNA levels of diabetic rats decreased at 17 wk of age and did not increase at 29 wk of age. There were some possible explanations for the reason that the nonproteolytic activation of prorenin occurs in diabetic rat kidneys. The affinity of the (pro)renin receptor to prorenin might be increased in diabetic rat kidneys, or unknown activator proteins that bind to the “handle region” of prorenin might be increased in the kidneys of diabetic rats. Alternatively, renal prorenin levels might be accumulated by a long-term inhibition of prorenin resolution, even if prorenin synthesis were suppressed. Prorenin-processing enzymes such as cathepsin B, which was predominantly present in the macula densa, metabolize prorenin and have been reported to be decreased in diabetic conditions by previous in vitro and in vivo studies.8,9 In this study, renal levels of cathepsin B mRNA and protein were also decreased in diabetic rats. This result suggests that the decreased prorenin resolution can accumulate renal prorenin content in 17-wk-old diabetic rats despite the decreased generation of renal prorenin, and that renal accumulation of prorenin may be enhanced in 29-wk-old diabetic rats by the recovered generation of renal prorenin. This concept might be also supported by the results of this study showing that renal total renin (prorenin plus renin) content was unchanged despite the decreased prorenin synthesis in 17-wk-old diabetic rats. Conventional RAS inhibitors can slow the progression of diabetic nephropathy10,11 but cannot reverse the glomerulosclerosis that has developed in diabetic animals. In this study, ACEi treatment only attenuated the progression of nephropathy, but (pro)renin receptor blockade successfully reversed the glomerulosclerosis that had developed in diabetic animals, suggesting that PRRB has more benefits than conventional RAS inhibitors. Recent studies demonstrated that (pro)renin receptor stimulates the matrix protein expression in rat mesangial cells through a RAS-independent mechanism12 and contributes to the development of nephropathy in diabetic AngII type 1a receptor–deficient mice.5 Therefore, the RAS-independent actions of prorenin receptor may play a key role in the regression of nephropathy that has developed in diabetic animals. A long-term (pro)renin receptor blockade significantly reversed the glomerulosclerosis and markedly inhibited the increase in urinary protein excretion after a significant nephropathy occurred in diabetic rats. Because the blood glucose level or MAP was unaffected by the PRRB treatment, the lowering renal levels of AngII and activated prorenin by (pro)renin receptor blockade was thought to cause the restoration of nephropathy that had already developed in diabetic rats. Thus, (pro)renin receptor blockade may be a useful therapy to reverse the nephropathy after its development in diabetic animals. We maintained male Sprague-Dawley rats (Charles River Labs, Yokohama, Japan) in a temperature-controlled room that was maintained at 23°C and a 12:12-h light-dark cycle with free access to water and a normal-salt-diet rat chow (0.4% NaCl; CE-2; Nihon Clea, Tokyo, Japan). The Keio University Animal Care and Use Committee approved all experimental protocols. At 3 wk of age, under sodium pentobarbital (50 mg/kg intraperitoneally) anesthesia, we removed the left kidney of 100- to 150-g rats and divided the heminephrectomized rats into two groups: The control rat group and diabetic rat group at 5 wk of age. Diabetic rats intraperitoneally received 10 mM citrate buffer with 65 mg/kg streptozotocin (Wako, Osaka, Japan), and nondiabetic control rats received 10 mM citrate buffer alone. At 12 wk after the streptozotocin administration, diabetic rats were further divided into three groups: Treated with vehicle, treated with the ACEi imidapril hydrochloride at 0.015% in their drinking water, or treated with the PRRB. The decapeptide PRRB (NH2-R10RILLKKMPSV19-COOH), which includes the handle region sequence,1 or NH2-M30TRISAE36-COOH used as a vehicle were subcutaneously administered at 0.1 mg/kg by the osmotic minipump (model 2004 for 28 d-use; Alzet, Cupertino, CA) implanted every 28 d. We decapitated at least six rats in each group at 12 and 24 wk after the streptozotocin administration to obtain the blood and right kidney of each rat. At 4 wk of age, we implanted a telemetry transmitter probe (model TA11PA-C40; Data Sciences Int., St. Paul, MN) into rats under sodium pentobarbital anesthesia (50 mg/kg intraperitoneally), and the flexible tip of the probe was positioned immediately below the renal arteries. The transmitter was then surgically sutured into the abdominal wall, and the incision was closed. The rats were then returned to their home cages and allowed to recover for 6 d before the start of the measurements. We monitored conscious MAP, heart rate, and the activity in unrestricted and untethered rats with the Dataquest IV system (Data Sciences Int. ), which consisted of the implanted radiofrequency transmitter and a receiver placed under each cage. The output was relayed from the receiver through a consolidation matrix to a personal computer. Individual 10-s MAP, heart rate, and activity waveforms were sampled every 5 min throughout the course of the study, and daily averages and SD were then calculated. The 24-h urine was collected in a metabolic cage, and urinary protein and creatinine excretion was determined with a Micro TP test kit (Wako) and a Creatinine HA test kit (Wako), respectively. Blood glucose was analyzed with a Glucose C test kit (Wako) using the venous blood that was obtained from the tail vein. A part of the kidney that was removed from each rat was fixed in 10% formalin in phosphate buffer (pH 7.4). Paraffin-embedded sections were stained by the periodic acid-Schiff method. We quantitatively determined the total area of sclerosis within the glomerular tuft, adopting the semiquantitative scoring system proposed by El Nahas et al.13 A glomerulosclerosis index was derived for each rat by examination of 100 glomeruli at ×400 magnification. The severity of glomerulosclerosis was expressed on an arbitrary scale from 0 to 4: Grade 0, normal glomeruli; grade 1, presence of mesangial expansion/thickening of the basement membrane; grade 2, mild/moderate segmental hyalinosis/sclerosis involving <50% of the glomerular tuft; grade 3, diffuse glomerular hyalinosis/sclerosis involving >50% of the tuft; grade 4, diffuse glomerulosclerosis with total tuft obliteration and collapse. The resulting index in each rat was expressed as a mean of all scores obtained. For immunohistochemical staining, deparaffinized sections were pretreated with proteinase K. After boiling the sections in citrate buffer with microwaves to unmask antigenic sites, endogenous biotin was blocked with a Biotin Blocking System (X0590; DAKO Corp., Carpinteria, CA). Next, the sections were immersed in 0.3% H2O2 in methanol to inhibit endogenous peroxidase and then precoated with 1% nonfat milk in PBS to block nonspecific binding. For evaluation of the kidney content of nonproteolytically activated prorenin and total renin, immunohistochemical staining of nonproteolytically activated prorenin and renin molecule was performed.4 The rabbit anti-rat GR antibody4 and rabbit anti–renin-molecule antibody14 were applied to the sections as the primary antibody. The sections were incubated with a biotin-conjugated anti-rabbit IgG as the secondary antibody, and the antibody reactions were visualized with a Vectastain ABC Standard Kit (Vector Laboratories, Burlingame, CA) and an AEC Standard Kit (DAKO) according to the manufacturers’ instructions. We quantitatively determined the immunoreactive nonproteolytically activated prorenin-positive area and the immunoreactive total renin-positive area in each glomerulus at ×200 magnification with a Mac SCOPE (Ver. 2.5; Mitani Corp., Fukui, Japan) and expressed it as a percentage of the whole cross-sectional area of the glomerulus. Dual immunofluorescence was performed on 4-μm cryostat sections. The primary antibodies were as follows: Rabbit polyclonal anti–cathepsin B antibody (1:50; Santa Cruz Biotechnology) and sheep polyclonal anti-Uromucoid antibody (1:20; Biodesign Int., Saco, ME), and the secondary antibodies were rhodamine-conjugated anti-rabbit IgG and FITC-conjugated anti-sheep IgG (1:500; Chemicon Int., Temecula, CA). The sections were examined with a confocal microscope BZ-8000 (Keyence, Osaka, Japan). The secondary antibodies had been isolated by immunoaffinity chromatography and absorbed for dual labeling. Control measures included omitting the primary antibody and substituting normal IgG from the same rat for the primary antibody. The renal cortex or medulla was lysed in T-PER reagent (Pierce, Rockford, IL) that contained 25 μl dithiothreitol (1 mol/L) and 250 μl PMSF (100 mmol/L), and after 5-min centrifugation at 10,000 × g, the supernatant was collected and subjected to SDS-PAGE. The proteins were transferred to polyvinylidene difluoride membranes, and after blocking the blots overnight with PBS that contained 5% bovine albumin and 0.5% Tween 20, they were incubated for 16 h with polyclonal rabbit anti–cathepsin B antibody (1:1000 dilution). Immunoreactivity was determined by using horseradish peroxidase–conjugated donkey anti-rabbit antibody and the enhanced chemiluminescence reaction, and the quantitative analyses were performed using Image Analyzer LAS-3000 (Fujifilm, Tokyo, Japan). Within-group statistical comparisons were made by one-way ANOVA for repeated measures followed by the Newman-Keuls post hoc test. Differences between two groups were evaluated by two-way ANOVA for repeated measures combined with the Newman-Keuls post hoc test. P < 0.05 was considered significant. Data are reported as means ± SEM. This work was supported in part by grants from the Ministry of Education, Science and Culture of Japan (16790474 and 17390249). We thank Ai Fukushima for her excellent technical assistance. See the related editorial, “Renin and Its Putative Receptor Remain Enigmas,” on pages 1989–1992. (Pro)renin Receptor: A Treatment Target for Diabetic Retinopathy?